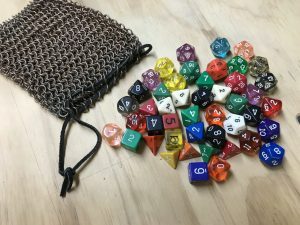 A return to D&D from a 20+ year hiatus – loving what you’ve done with the place. HomeUncategorizedUnlisted: A return to D&D from a 20+ year hiatus - loving what you've done with the place. Unlisted: A return to D&D from a 20+ year hiatus - loving what you've done with the place. The TLDR: Obligatory “I’m back” post that got waaaay out of hand. I intended on doing a short little blurb about my first session and it turned into this. Read on if you dare! I played D&D for the first time back in my 20s (late 90s) when 2nd edition was current. This was after all the TSR turmoil (except for them going belly up) and I had no idea of the massive showdown between founders and hostile takeovers etc. Crazy stuff. No, we were blissfully unaware of all that and we frequented the local Walden Books hoping to catch a glimpse of whatever new module might be coming out at the time. I had played with some friends in the nearby town and had some epic late night sessions in the basement of a troubled boys home (DM’d by one of their councilors) but this was a good 20 miles from my house and it just didn’t make sense being a poor high school student to make the drive all the time. They had the most insane Harry Potter “great hall” style long tables stashed down there too which made for a great spot to play. Due to geography and gas prices (laughable now) I started DMing for my local circle of friends at my small high school. We were literally the most unlikely D&D players ever being from farming families, playing sports etc, but there we were. Many adventures were had and memories were made. Over the years our group drifted apart with college and girls entering the picture and I eventually stopped playing all-together. 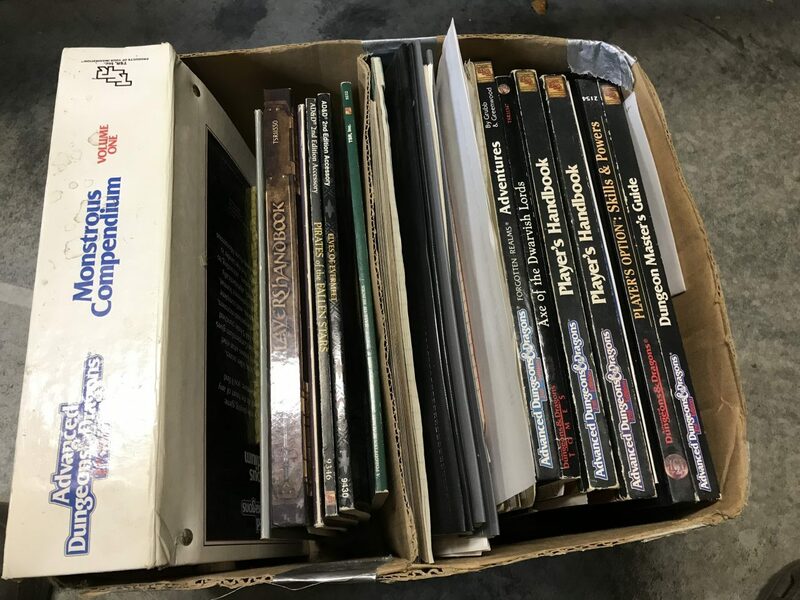 I had sold off the majority of my D&D collection managing to keep the essentials for the Ravenloft campaign I had been running, but it was a shadow of what it had been. I popped in for one of my buddies games here and there over the years but for the most part I was done with D&D. Fast forward 20 years or so, one wife and 2 kids later and I run across a book on Audible called Of Dice and Men. I am a frequent consumer of Audible content due to my long commute and this book caught my attention so I gave it a listen. Predictably following these events I went searching through my belongings for my old D&D stuff. Luckily my mother had done a great job of caring for them while I went through my bouncing from apartment to apartment phase of my younger years. 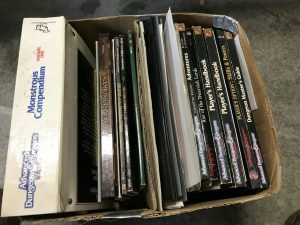 They remained in the same box I used to cart them around wherever we might be playing on D&D night and were no worse for wear. Thanks mom! As i’m rifling through all of the old contents of the box I dump out my old dice bag on the table. This sparks the interest of my 8-year-old who has up until now been ignoring all of the old books I had scattered about. I have always had a strange facination with the dice themselves and apparently my daughter does too. She immediately starts twenty questioning me about what they were and what I used them for. As I am explaining things to her she becomes transfixed on actually “playing” the game. I finally agree to “DM” a short game for her where her wizard would battle a Blue Dragon (Random Mageknight mini I had laying around). I didn’t use any real rules or stats. The thought of trying to explain THAC0 (2nd Ed. term) or savings throws to an 8-year-old didn’t sound appealing and I wasn’t sure if I could recall the rules anyway. 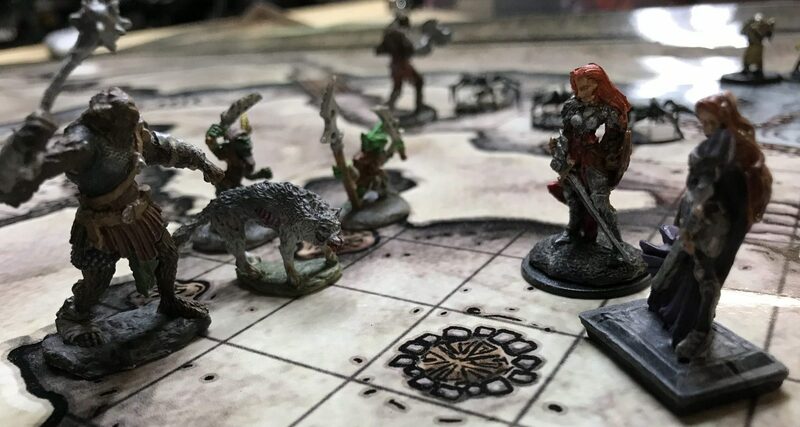 The combat mechanics were clunky and my DM skills rusty, but to her it didn’t matter. It was clear that with the combination of my storytelling and the fun of rolling damage and finally vanquishing the dragon had her hooked. I really didn’t see that one coming. 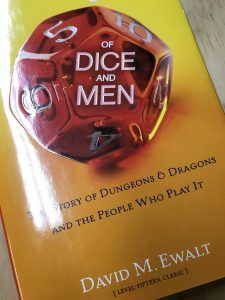 Author David M. Ewalt of the aforementioned Of Dice and Dragons book had a short chapter on visiting D&Ds latest owner Wizards of the Coast and previewing the what would eventually become the D&D 5th edition. Because of this I knew it was out there and I had actually seen the starter sets at my local Walmart of all places. With my daughter continually asking me when we were going to play again and some positive vibrations on the feeler texts I had sent out to my old group I knew it was just a matter of time. A quick internet search for gaming stores in my area and I was headed out on a mission. We were going to play Dungeons and Dragons again. 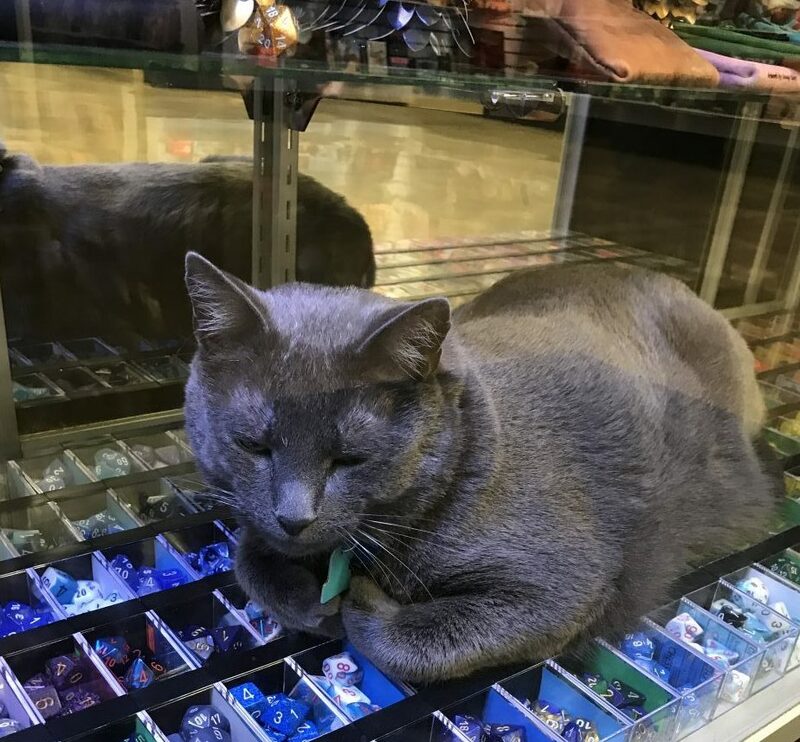 Toe-bias (named for his 6 toes on each foot) is a bit of a fixture at TableTop – He even has his own business card. I pulled up to my local store not knowing what to expect. Gaming stores of my era where tiny little hole-in-the-wall shops with smelly patrons, dirty windows and uneasy glares given to anyone walking through the door they didn’t know. Boy was I in for a shock. TableTop Game and Hobby in Overland Park Kansas was something out of my dreams. The store itself was huge, well lit, clean, extremely well stocked and the folks running it were as friendly as they come. Half of its formidable square footage is dedicated to a free-to-use play area ranging from Warhammer 40k to D&D to board games and just about anything else you can think of. I was completely blown away by this place. They even have an often foul-tempered associate named Toe-bias (because he has 6 toes on each foot) who I believe is only tolerated because he is so cuddly. 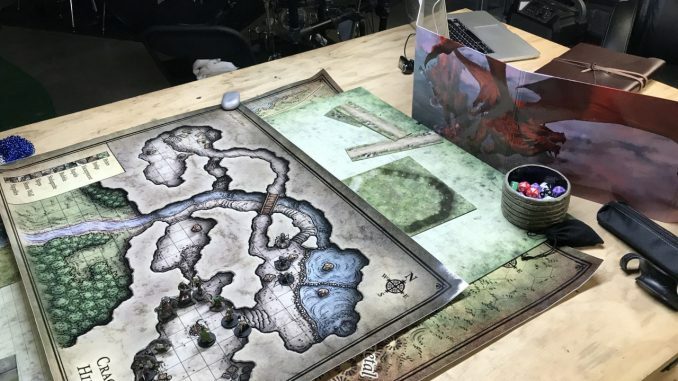 I did not join in on any offers to game there but I did get turned on to some of Dungeons and Dragons board game offerings which might be perfect for introducing my family into D&D without burying them in information. I walked out with a copy of the Wrath of Ashardalon board game and a 5th edition starter boxed set. This would be perfect. 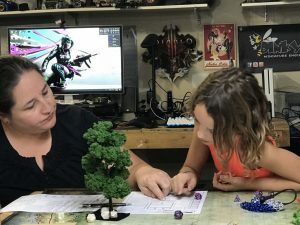 My family could play Ashardalon pretty casually easing into some light D&D like mechanics and I could get my daughter off of my back while I ramped up on 5e. 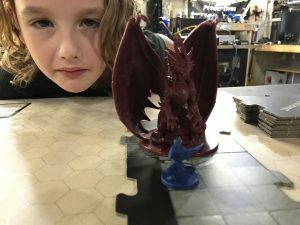 My daughter meets Ashardalon in her first official tabletop gaming experience. So 3 editions later and I’m amazed at what I had missed. D&D kinda took a couple wrong turns as I understand it between 3 and 4e but re-introduced miniatures which I applaud. 4th edition kind-of stifles role-playing a bit, pisses off the base players and Pathfinder is born. WotC finally finds its way and here we are at 5th edition. Does that sort of sum it up? I was always bummed about 2nd edition how miniatures were all but nonexistent. I had a few RP minis laying around from the AD&D days, but they just weren’t integrated into second edition at all. That is the first welcome change with 5e for me. In the few weeks since my starter set purchase, I dove headlong into painting miniatures. Instead of just prepping a session, now i’m prepping my villains and monsters too. Also having a friend in the printing business meant I could get full-scale maps printed (purchased from Mike Schley) of all the dungeons and maps from the Lost Mine of Phanelver adventure that comes with the Starter Set. Being DM as a grown-up (so to speak) has its advantages. My players were going to get an experience I never had, but always wanted. A visual experience to go along with the roll playing aspect. Combat could be tactical and descriptive at the same time. To go along with the new players in my family I recruited some good friends we had met along the way who were interested in trying out this old game they had only heard of. Pepper in a couple of old timers from my past sessions and we were ready to go. Luckily for my first session back I had an experienced friend there to help me get over the bumps with the new rules. 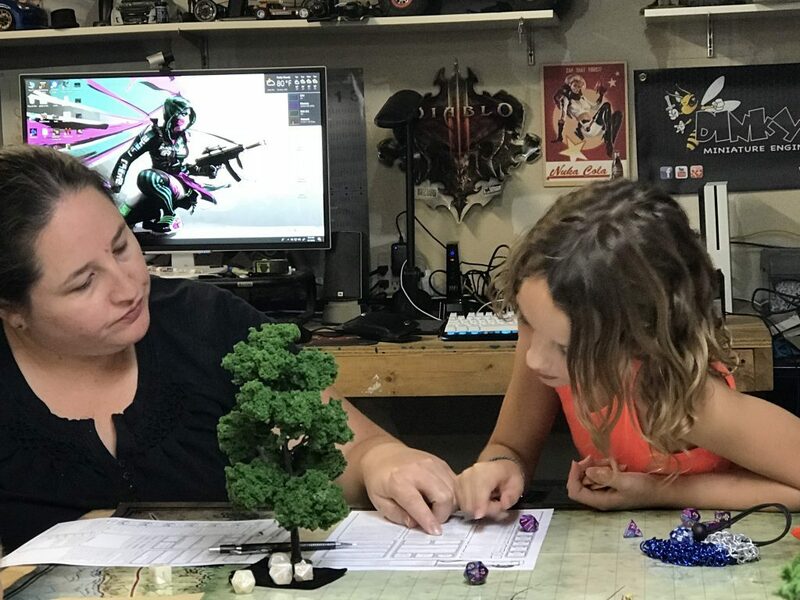 He had been DMing for years and had already run the starter module for his local group, but was still more t han eager to play along with the newbi’s to introduce them to the game. 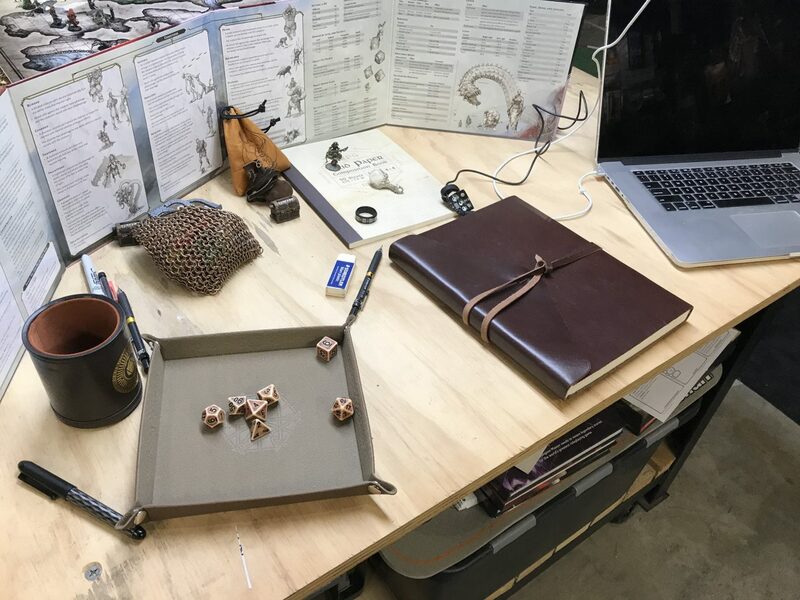 We had a great first session with many of my new players jumping right in without that first game awkwardness that new players often have. There were pranks between our sticky-fingered rogue and our snooty high elf wizard which resulted in several failed animal handling checks that had everyone at the table laughing hysterically. They stopped laughing when they realized the rogue had not stopped the equipment laden wagon once he regained control. For my daughter, it was a great experience to spend some time with her parents as well as exercise those new math skills. She learned there are consequences to brash actions and a little thinking ahead isn’t such a bad thing. Life lessons for us all I guess. I really had no intention of getting this wordy with my “I’m Back” Reddit post, but the blogger got the best of me. It kind of just poured out of my fingers so if I bored you to death I apologize. I hope the pictures were at least a little entertainment. If you made it this far into my post, thank you for reading. I’ll be behind the DM screen. I entered the hobby in the golden age of RC when race cars and bashers were the same thing. I have over 29 years of experience and have participated in almost every segment of RC there is. For the last 6 years I have immersed myself in the media side of RC in the efforts of converting my passion for RC into my job. From video editing and photography to writing about drift cars and scalers, RC continues to be my passion and probably will be for the foreseeable future.